Hypothermia in newborns is common worldwide and the incidence of is substantially higher in developing countries. Even in the United States, many babies require hospitalization because of hypothermia. 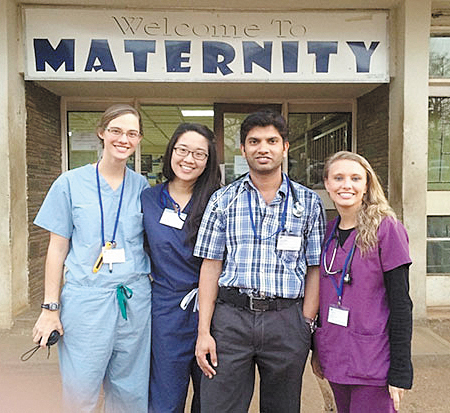 A team of physicians, nurses and medical students from UAB are working in collaboration with their counterparts from Zambia at the University Teaching Hospital to find a low-cost way to protect newborns from hypothermia and improve their chance of survival. One such way is through kangaroo mother care (KMC), a technique that provides warmth to an infant through direct skin-to-skin contact. KMC, also known as skin-to-skin care, was initially developed in the 1970s to care for preterm infants in countries where incubators were either unavailable or unreliable. The direct skin-to-skin contact with the parent helps ensure physiological and psychological warmth and bonding and the parent's stable body temperature helps to regulate the neonate's temperature more smoothly than an incubator. Researchers from UAB and Zambia looked at the effectiveness of Kangaroo Mother Care right after birth when the babies are most at risk of hypothermia. A study published in the Archives of Disease in Childhood showed practicing shorter durations of KMC during the first few hours after birth does not prevent moderate hypothermia in the infant. However, the study showed babies who received longer durations of KMC more than 80 percent of the time were protected against hypothermia in the first few hours after birth. "Kangaroo Mother Care is commonly practiced in many cultures, promoting breastfeeding and mother-baby bonding, but it has not been tested right after birth as a way to prevent hypothermia," said Manimaran Ramani, MD, lead author and assistant professor in the UAB Division of Neonatology. "It is possible that kangaroo mother care will be beneficial in preventing hypothermia in infants born in resource-limited facilities, like in Zambia, if it is practiced for a longer duration of time." The team found that infants who received Kangaroo Mother Care more than 50 percent of the time during their hospital stay did not have the risk of hypothermia at discharge. To reduce the neonatal hypothermia, the World Health Organization recommends a set of interlinked procedures called the "warm chain," or thermoregulation protocol, to be implemented with every newborn from birth until the first few hours to days after birth. The warm chain procedures include warm delivery rooms, immediate drying, as much uninterrupted skin-to-skin contact as possible, early breastfeeding, delayed bathing and weighing, appropriate bundling, mother and baby together, warm transportation, warm resuscitation, and improved training and awareness. "Not all elements recommended in the WHO thermoregulation protocol are practiced routinely in many birth facilities around the world," Ramani said. "Kangaroo Mother Care is a low-cost intervention that could save the lives of infants by providing natural warmth from the mother if used consistently during the first few hours after birth." There are several factors that could impair the mothers' ability to provide continuous KMC, including post-partum tiredness, sickness, hygiene care, routine postpartum checkups, essential newborn care and frequent diaper changes. Other factors that are hard to control and play a role in the infants' body temperature include unregulated delivery room and postnatal ward temperatures in the resource-limited birth facilities. Visiting physicians from UAB continue to search for alternative options to help prevent hypothermia of infants in Zambia.